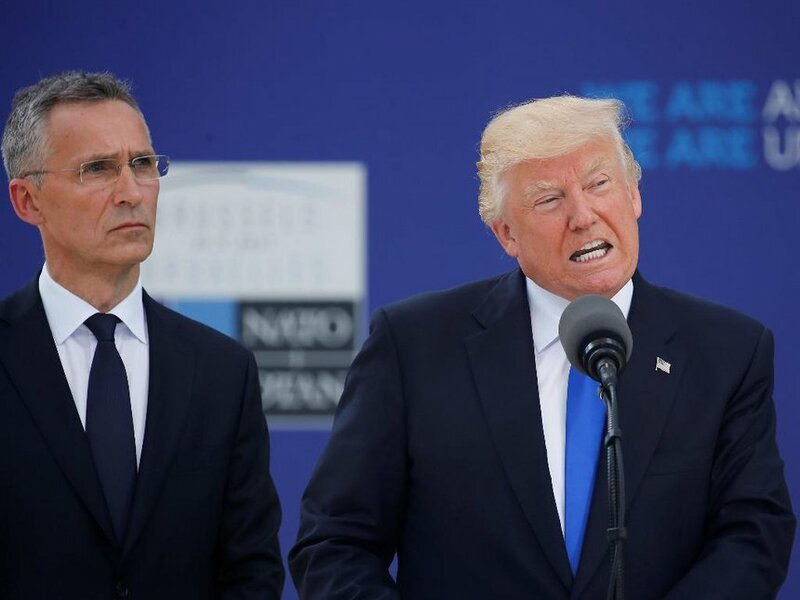 Tomáš Valášek, a former Ambassador to NATO, now director of Carnegie Europe, discusses the optics, the outcomes and the likely ripple effects on transatlantic relationship of Trump’s rhetoric. In his first official European tour, Donald Trump’s speech at the inauguration of the new NATO HQ in Brussels, triggered some very intense reactions from the allies. On the old continent, the omission of Article 5 generated serious concerns about the US reliability and commitment to NATO. A few days later, chancellor Merkel’s remarks in Munich (“Europeans truly have to take our fate into our own hands”) produced its fair share of concerns on the Eastern Flank. Defence Matters invited Tomáš Valášek, a former Ambassador to NATO, now director of Carnegie Europe, to discuss the optics, the outcomes and the likely ripple effects on transatlantic relationship of Trump’s rhetoric. Donald Trump doesn’t seem to believe in the West, in the liberal international order or its institutions. This might have dangerous consequences especially in a time when “the world America made” is under assault. We used to see US as the indispensable power. Now it looks like dispensable power. How do you see Donald Trump’s impact on the West? I disagree slightly with the characterisation. The jury is still out. It is pretty clear that it is not in Donald Trump’s nature to think of the alliances and US global leadership as something that is good for the United States. He has been fairly consistent on the subject, with his opinions going as far back as late 1980s that allies (either Europeans or Asians) are taking advantage of the United States. He seems to regard any long-term relationship as basically a net drag on US resources. We know this for fact. His actual policy is still a bit of an enigma. I grant that he has been ambiguous on Article 5 (NATO’s famous defence clause that obligates all allies to come to the aid of one another), but I am being told by my friends in Washington that he believes silence on the subject is a good negotiating tactic that will prompt the European allies to spend more on their own defence, rather because he is not going to defend them. There is a big difference between the two concepts. One is a philosophical rejection of the idea that the US should defend its allies. The other is a deliberate ambiguity on a subject because it believes that it is a tactically good and sound way of getting the allies to invest more in their militaries, but it doesn’t mean it would not actually defend them. The jury is still out on what he is trying to accomplish. There is some evidence that the approach is working. Canada has announced increasing the defence spending with the foreign minister basically saying that it is because of the shift in the US will to play the role of a global leader. They are suggesting that the approach of Trump Administration is actually working. I am asking because I am also concerned about the consequences of his message on the credibility of the article 5. Ron Asmus used to say that the credibility of article 5 is not only about capabilities, but also about political will and solidarity. How would you assess the impact of Donald Trump on the credibility of article 5 and more broadly on the solidarity that is underwriting the transatlantic relationship? Having argued that he has not philosophically made a decision to reject the alliances let me also say that the deliberate tactic that he has adopted of being ambiguous about the US interest in the alliances is by itself very dangerous. The risk is obvious. It risks sending a message to those who would like to test NATO’s resolve that it is now free and ok to do so because the US is not going to actually come to the allies’ defence. The obvious worry in this regard is Russia. Ideally for the purpose of deterring Russia you want to send a crystal clear message that in case one country is attacked all 29 would immediately jump into action. That is not what Article 5 says (article 5 it is a bit more ambiguous), but in practice the allies have always acted as though Article 5 was completely automatic because they have found it is a safer way of dealing with Russia, while ambiguity only risks inviting trouble. President Trump is inviting trouble. His policy of ambiguity is raising the possibility that Russia will conclude that it can actually try to act against one ally/probe one ally without prompting a response from the other 28. And this is not just because of the things he did say or he didn’t say at NATO, but also because of the things he said during the climate change speech where he essentially spoke of all alliances, and especially of the European allies, almost as adversaries. He almost made the thesis that essentially it was Europe that has trapped the US into agreeing something that will limit the US sovereignty, and that these are the same countries that are not spending enough on defence. The tone was remarkable. We’ve had our share of differences between Europe and US in the past, during the Iraqi invasion, but I have never heard a US president actually speak of Europe in these terms. In combination, those two events - the ambiguity in Article 5 and the fact that it seems to genuinely regard Europe as a problem - raise serious concerns and doubts about US solidarity and reliability. We already see the push for an integrated defence market, collective capabilities, common funding, common HQ infrastructure. How far do you see this effort going? How should it be devised in order not to weaken NATO? Do you see any danger of stepping in NATO’s article shoes? The risk I see on the European side is that of overreacting. I can see that under President Trump the Article 5’s guarantee is much less reliable than before, but it is still irreplaceable. It is the simple consequence of the US military strength, of the size of its nuclear arsenal, of the skills of its commanders and soldiers, of the willingness of its leaders to take risks. There is simple no replacement of the US when it comes to the business of deterring Russia. It is hard to imagine how the EU would ever acquire the same mindset and means to replace the US. It is just not going to happen in my lifetime. Because of this, if we try to remove Article 5 responsibilities from NATO and giving to the EU, I think it will be bad for the security of Europe because we will never be able to fill adequately the role NATO has, even a weakened NATO with an ambiguous US president. Having said that, one of the implications of the president’s new stance and position means that at the very least we have to start thinking about the day when US disengagement might become a reality. I don’t think that we should start working actively in this sense, but we need to start thinking at this possibility. One practical thing that we should do is start working on an agreement that would allow European countries make use of NATO assets even in cases that the US is not involved. I am referring to the possibility of using the fleet of C17 transport aircraft, the AWACS fleet in Germany or the fleet of Predator drones in Italy, the command structure that stretches from Northern Germany to Southern Italy. These are all assets without which it is hard to fight a high intensity war. These are assets that the European countries are not likely to develop or duplicate on their own; it takes a lot of time and it would be very expensive, but we would need them in case of high intensity warfare. My simple observation is that because the uncertainty of president Trump, we need to start thinking, not actually moving towards, what do we do when the US is not engaged and the answer is that if we want to fight high intensity wars we can only do so effectively with the use of NATO assets so therefore we should seek to lock in the use of those assets. Europe’s first choice must be to seek an arrangement with the alliance that preserves the recourse to NATO’s plans, commands, and assets. Can you use these assets under EU command? Can you use NATO command structure under the flag of a coalition of European countries? These are big questions to which we don’t have the answers we should. Tomáš Valášek is the director of Carnegie Europe, where his research focuses on security and defence, transatlantic relations, and Europe’s Eastern neighbourhood. Previously, Valášek served as the permanent representative of the Slovak Republic to NATO for nearly four years.